Throughout the last days of the Third Reich, it ruthlessly forced its desperate conscripts by threat of summary execution into service to slow the overwhelming Soviet army. issued a radio proclamation to the trapped troops [of Berlin]: “Any man found not doing his duty will be hanged from a lamp post after a summary judgment. 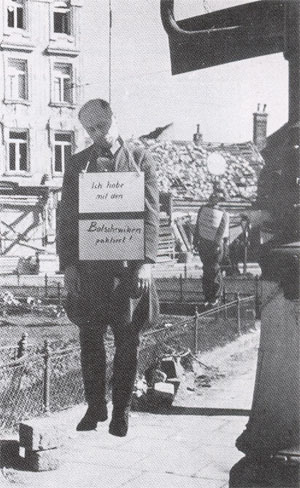 Moreover, placards will be attached to the corpses stating: ‘I have been hanged here because I am too cowardly to defend the capital of the Reich. I have been hanged because I did not believe in the Fuhrer. I am a deserter and for this reason I shall not see this turning point in history. boys who were found hiding were hanged as traitors by the SS as a warning that, ‘he who was not brave enough to fight had to die.’ When trees were not available, people were strung up on lamp posts. They were hanging everywhere, military and civilian, men and women, ordinary citizens who had been executed by a small group of fanatics. Although it’s not specifically an execution story, the horrifying consequences of this lethal paranoia under siege are the theme of the West German film Die Brücke, in which a rare veteran sergeant looking after some child-conscripts is shot by a patrol when he can’t produce orders … leaving the children alone to be butchered pointlessly defending a bridge. You call them fanatics . well I thank them for defending The West against bolshevism. The Germans have been falsely blamed. The soviets were building up their forces getting ready to attack Germany and take all of Western Europe. Honour the sacrifice of those who died to stop the spread of the Revolution. surfaced but nothing was done due to greed and a need of land to expand .I could go on and on.The thing is every race and people are guilty of this and usually force and genocide prevail.We are not a gentle people that care for others.I too would do things no t proper to defend my place and family just as the man in the cabin would .Unfortunately violence begets violenceThere are very bad people out there.My dad had a choice volunteer to go to the russian front or get shot right there.You know something, a lot of the russians were people just like them.We all want the same things to live in peace have kids and grow old with grandchildren but like i said there are some very bad people out there especially now. Youre walking after dark and are attacked. Do you fight back or allow yourself to be murdered because you don’t believe in violence. Either way you are involved, do you walk away or lie in the street as a martyr. Dawn… you may not want to kill, but if it’s between you and the man who wants to kill you, what is your decision? To die? Armies don’t exist to kill for fun; they exist to defend their nation and its people against those who wish to kill them. You may not like authority, you may be anti-military (or just incredibly naive and idealistic, it seems) but its everyone’s duty to defend their country if it comes down to it. Sorry, but you ARE in fact a coward. If I were a man and had been called up in the war, I would have refused to kill Germans or anyone else, not because I am a coward, but because it is wrong to kill people. Thou shalt not kill doesn’t allow for exceptions. I could never have considered the other side to be enemies. They weren’t. Most were innocent citizens. you KNOW played out in history: When some rancher hears the indians coming, screaming war whoops and shooting arrows, guns, etc at the rancheer and family… he puts his wife and kids in the root cellar to hide. The indians come charging in, arrows flying all about as the rancher closes the door. The indians arrive, arrows, axes, hatches in hand, busting in the door. If you are the rancher and whether or not you are armed, do you murder your self, your kids, your wife, or an indian? Face it. Inaction, knowing the indians WILL kill everybody in the cellar, is KNOWINGLY allowing someone else to die when you could have prevented it (or at least tried!) Or, killing yourself to avoid making the decision can happen as easily as doing NOTHING. Suicide is wrong, it is murder, also. And of course, you can not shoot at the indian coming in the door. God gave you those kids to raise for HIS glory, to teach them HIS truths, etc. but you decided to do NOTHING. Some, at least, must have known how wrong it was to kill and were being brave running away. 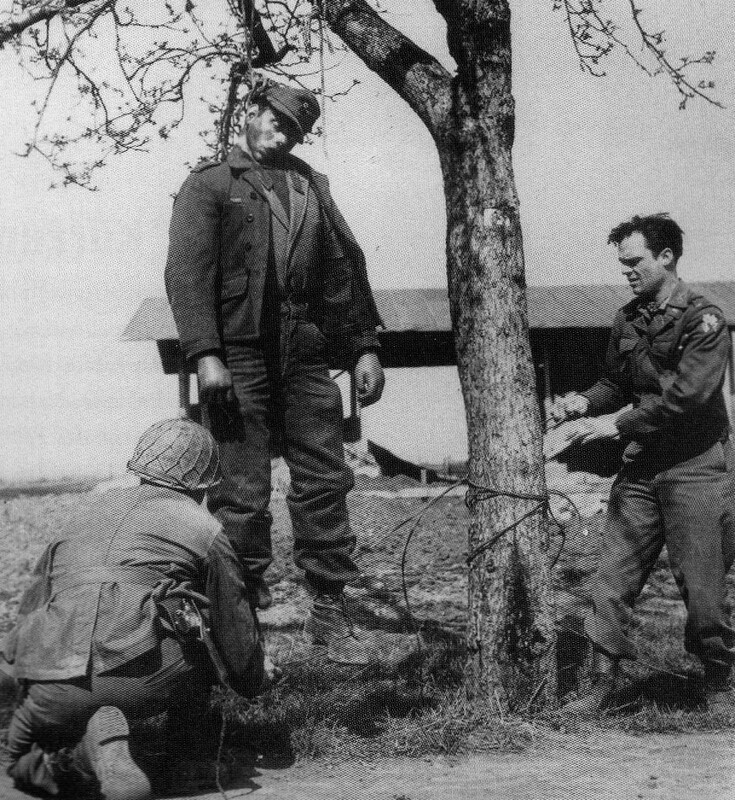 Innocent Citizens of Germany were forced to fight just like our Innocent Citizens. I would have refused to kill them. They weren’t enemies, in fact some were probably related to English people. People cannot suddenly be your enemies because the heads of your country declare war.